Anhydrite is an anhydrous calcium sulphate and a member of the Sulfate Class of minerals. Anhydrite does not form directly, but is the result of the loss of water in the rock forming mineral Gypsum. This loss of water produces a reduction in volume of the rock layer and can cause the formation of caverns as the rock shrinks. The blue form of Anhydrite is called Angelite because of the heavenly blue colour. When exposed to water, Anhydrite transforms back to gypsum. This transformation is reversible, gypsum forms anhydrite by heating to 200°C under normal atmospheric conditions. 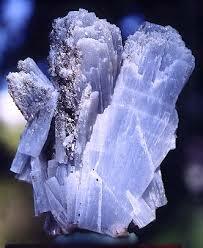 Anhydrite occurs as clear, blue, purple or grey long bladed or short crystals in matrix. The crystals are translucent and some crystal specimens have been known to be fluorescent under UV light. Anhydrite can be found with calcite and halite. Anhydrite treats disorders of the throat, especially those caused by a difficulty in expressing yourself. It removes retained or excess fluid and disperses swelling. It balances the thyroid and the parathyroids. This soothing stone repairs tissue and blood vessels, balancing the fluids within the physical body, and can act as a diuretic. It is useful in weight control, and relates particularly to the lungs and arms. Anhydrite can cool the pain of sunburn. Anhydrite helps you face with equanimity what tomorrow may bring. Anhydrite is useful for people who have difficulty in coming to terms with incarnation and who long for the post death state. Teaching acceptance of all that life has brought, releasing a hankering for the past, it assists past life healing, showing the gift in all that has been before. Anhydrite stabilises your emotions and the physical and emotional bodies. It calms, enhances creativity and psychic ability. Anhydrite helps you speak out for yourself, it aids your ability to teach or perform. It dispels anger and helps your achieve forgiveness. Anhydrite helps you to be more compassionate and accepting, especially of that which cannot be changed. It alleviates psychological pain and counteracts cruelty. It transmutes pain and disorder into wholeness and healing, opening the way for spiritual inspiration. It creates a deep feeling of peace and tranquillity. It helps connect to universal knowledge and raises awareness. 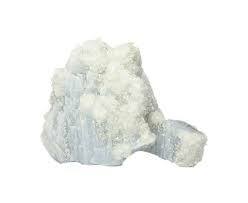 Anhydrite facilitates the re-birthing process, stimulates healing and opens psychic channelling. The drusy form of Anhydrite promotes empathy and compassion for all life. It calms and comforts. 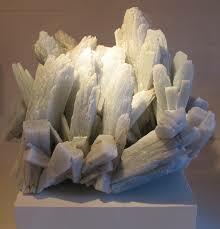 Anhydrite is a powerful stone for healers because it deepens attunement and heightens perception. It also provides protection for the environment or the body, especially when taken as crystal water, use the indirect method to make the crystal water. Anhydrite promotes acceptance of the physical body as a transient vessel for the soul. Anhydrite facilitates conscious contact with the angelic realm. It enhances telepathic communication and enables out of body experiences to take place while still maintaining contact with everyday reality. 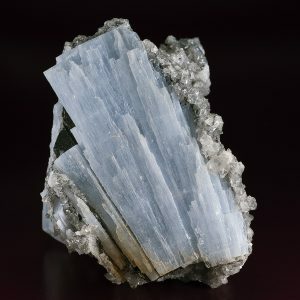 Anhydrite will promote a connection with your spirit guides and angels and assists you in hearing them. It draws angelic protection to you and your home. 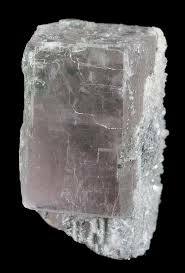 Anhydrite helps with the re-birthing process, and promotes psychic communication with people and pets, It has been known to aid channelling. It will help with meditation and spiritual journeys. It is ideal for the psychic healer to use, as it helps you ground as you heal. ​purple Anhydrite stone stimulates communication with those not on this physical plane, being such as spirit guides, devas, angels and discarnate entities. This stone receives psychic information and healing, channelling, and automatic writing. It will increase all psychic abilities.